Last night saw the start of our next scenario in “The Winged Horse” campaign. This is the 5th scenario from ‘Red Devils in the Night’, entitled “Where’s Merville?”. This is a hypothetical scenario, written to highlight the issue of the scattered parachute drop of the 3rd Brigade as it attempted to assemble to assault the Merville Battery. All the hedges are Bocage. There are random breaks in the hedges along the roads. …and then randomly allocated a squad to each point, using a D8. The game started with a German 222 Armoured Car moving onto the table. The German force is all based in vehicles – Chain of Command rules only allows you to bring a single vehicle onto the board in each phase. The Paras had a double-phase at this point. 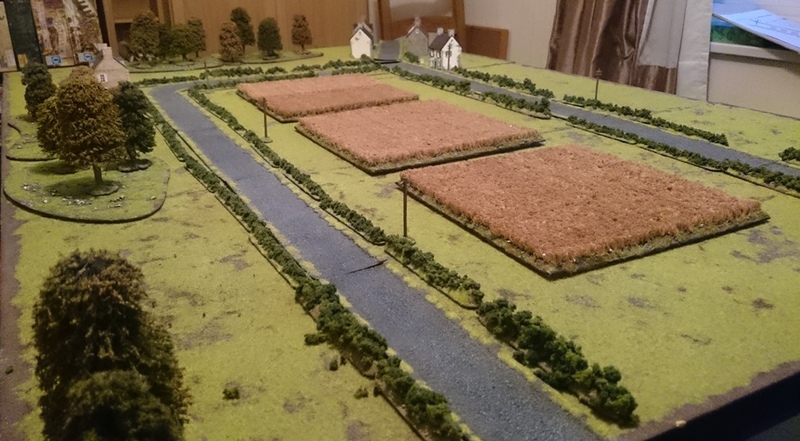 One squad continued to move across the field, whilst the PIAT team fired on the Armoured Car…and missed. (Even if they are up against bocage, we rules that they could still fire through it) We also ruled that vehicles, especially since they were using headlights, were more easily seen that troops, so can be automatically targeted at close range – 18″. Here we had what is fast becoming our ‘rules discussion du jour’. In most wargames rules, you can fire back at a unit that fires upon you – even if they have missed. However, this is a specific situation. The scenario takes place at 03:30, so night rules are in effect. The PIAT Team are hidden in a piece of bocage. They are also firing a spigot mortar, which fires using a spring, so there will be no muzzle flash. Given that they are also engaging a vehicle, which has limited visibility, and that one of the major senses for spotting at night – sound – would be made useless to the crew of the 222 by the engine noise, would they be able to see them? In an added bonus, we are sat in Dave’s downstairs back room, with the curtains open. Dave turned the light off. We looked outside, and tried to spot the bottom of Dave’s garden, which is less than 30 yards away (roughly the range the PIAT was firing at – about 10″). We couldn’t see it. So we rules that the Paras couldn’t be seen. So, despite the fact that the Paras are in plain sight on the table, I had to play as if they weren’t there, because I didn’t know that they were. a) Playing in the dark is a pain in the backside, and the sooner Rich & Nick write some official rules for night fighting, the better. b) This type of country really encourages the proper use of Panzer Grenadiers! More Germans appear, including a 234/1. WHAM! As the 222 Armoured Car advances, it’s commander busy looking for landmarks, it is hit in the side by a PIAT. The explosion kills the gunner, and leaves everyone else with their ears ringing. The first unit of Panzer Grenadiers de-bus by the road junction, but fail to spot the approaching Paras in the darkness. Part II should be published at the end of the week. We play a different set of rules and still have problems with playing night scenarios. One thing that does help is having the troops that can’t be seen held off board. This requires an umpire but it means that things like a night ambush can actually work. When you add things which don’t reveal the ambushers – grenades and PIATs – you can neatly recreate the fog of war. It’s almost like what happened at the Orne River Bridge where one PIAT team managed to knock out a German PZ III and send the rest of the column with it packing. Nice report and your terrain is really good. I have had this campaign book for sometime, I will have to dig it out. Otherwise though blinds would seem a good solution with figures placed, as you say, when they fire or when within a certain range (getting less murky and therefore longer range as time goes on…if you were so minded). Just a thought. I hadnt realised until recently that there were different sealanding times for beaches too – I’d assumed they were simultaneous (to the extent that the nature of what they were trying to do could be!). Amazing operation wasnt it – if I only had time to study one military operation I think it would be this…maybe thats a question for the podcast….? ?